However, reducing that death rate, doesn’t need to be complex. Three large scale multi-centre trials into Severe Sepsis and Septic Shock: ProCESS (USA), ARISE(Aus), ProMISe(UK), all showed the same thing. What works is good early resuscitation (Not the fancy stuff from ICU – however, that does have its place later on). In ED we are used to working on limited information and this is no different in the case of sepsis because TIME MATTERS. Unlike STEMI their is no quick confirmatory test we can perform to prove your hunch is right! And this is why we need to follow our hunch and look for Red-Flags. In 2016 NICE moved away from SIRS as it is neither sensitive or specific (i.e. it both Over-Alerts and Under-Alerts, studies showed about 1/3 of sepsis patients in ICU didn’t trigger). NICE/Sepsis trust now define sepsis as follows. The 3 big trials all showed the best treatment is doing the basics well, and quickly. 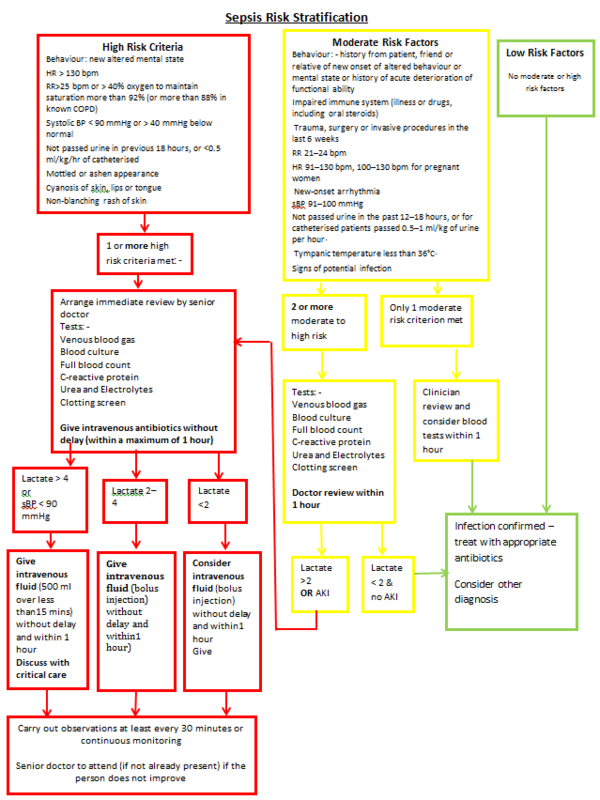 Blood cultures: This may not aid treatment in the ED, but its important to get them before antibiotics are given if possible (although this shouldn’t unduly delay antibiotics) as they can guide the ongoing therapy. Lactate: This helps us guide therapy in the ED. Lactate > 4mmol indicates Septic Shock (mortality >50%) we will need to be more aggressive with fluids up to 30ml/kg (i.e. 2l for a 70kg patient), and if not resolving will need ICU input. Antibiotics within 60min: As the graph in Step 1 showed , getting this antibiotics in early dramatically improves patient survival. Use condition specific antibiotics if possible but if in doubt use the “Sepsis of Unknown Origin” regime. Oxygen: Oxygen usage has also changed – you are just trying to maintain “norms” (i.e Keep SaO2 >94% OR 88-92% in COPD). Why has it changed? – well we think that high oxygen levels can be harmful. Urine Output: This is the best way to ensure adequate perfusion , and is especially important in Septic Shock, as we will be using aggressive fluid management. Anyone triggering Red-Flag sepsis or Septic Shock we need to review regularly, with a SENIOR. As part of those reviews we should Repeat Lactate after 60mins of treatment. Repeating the lactate can help guide your fluid therapy, and if not responding to treatment it can trigger involvement of ICU. As early inotropes saves lives if they are appropriate. Thanks to everyone involved in the video, LMFAO for a killer tune, and Prof. M&M for introducing us to FUNtheory. And Kurt sorry for the graph!! !